Nine - check out the murder of Bill Williamson by callous gold digger Anne Browning. She eventually admitted to his murder stating that it was a crime of passion because he had threatened to leave her. The police weren't happy with her story because it was clear she killed him for his money and proceeded to help herself whilst he was still a missing person. His body was found in a deep grave in her garden, his head bashed in with a base ball bat. Like Tabak, she thought admitting to the killing was enough and admitting to a crime of passion would get her less time inside. Admitting to a killing isn't the end of it - motive is also an important factor for obvious reasons. Twenty years on, the mystery of who shot Jill Dando still prevails. / Re: Barry George revisited. Why would you prefer to look at all the conspiracy theories when Barry George confessed to the murder? Why do you think Michelle Diskin Bates was so keen to move on following Simon Hall’s confession? “As a family member of a terrible miscarriage of justice, the victim being Barry George, convicted of the murder of Jill Dando; the Simon Hall confession is a concern because it is already so difficult for true MOJs to be believed by the public; this confession damages the credibility of all those still fighting for justice. But this is just one case. The British Justice System makes many, many more errors when it choses to build its cases around a person, rather than on the actual evidence. One confession is not a comfortable situation for those fighting miscarriages of justice, but is it worse than keeping hundreds of innocents locked up for crimes they did not commit? All of us who choose to stand up for justice need to take this on the chin, and move on…back to those who deserve to have their cases reviewed and quashed. What lessons did she learn following the confession? The guilty walk in the footsteps of the innocent. Fear not,SY are still at the draft stage, it cost a packet mind, circa a mere £12 million but it'll be some best seller if ever put into print.Still nowt to say Amaral was wrong.Still nothing brought up in the last 12 yrs that wasn't brought up in the first few months. Michelle Bates involvement in the Bamber case is surprising given what we know about the conviction. Jeremy Bamber is certainly no Barry George, the two cases couldn't be more different. Is she in denial or is she knowingly deceiving others? Amaral has been revealed as corruptly orchestrating those lies fed to the media when he was senior investigating officer in Madeleine's case. He has encouraged belief in them in his best seller. He has built a media career proselyting them. What will it take for sceptics to see through this man and give Madeleine's family the peace so long denied? It’s all linked in with the false reality she’s created. My opinion & my observations. Twenty years on, the mystery of who shot Jill Dando still prevails. / Re: How Credible Is The Theory Involving Serbians? As his sister, Michelle is naturally protective towards him given his mental disabilities. His sister strikes me as a highly narcissistic individual who has created a false reality for herself and her brother. She appears to be lacking in insight. I’ve met his sister and communicated with her many times, therefore my observations and opinions aren’t just based on what is in the public domain. “A narcissist can be a great storyteller. They captivate you with tales of personal triumphs, heroism, even selflessness. But it’s when you look behind the curtain that you discover they’ve rewritten history. Not only are they living in a fantasy, you believed all their self-mythology. I wonder what led you to that understanding? Another poster seems to be relying on how it's front page is laid out. 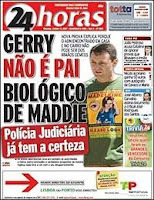 Follow this link, scroll down and there is a front page of 24 Horas, screaming Gerry McCann is not Madeleine’s biological father. Similar or dissimilar to the Sun in forum members views? Gerry McCann has been forced to issue an extraordinary statement insisting that Madeleine is his natural daughter. The heart consultant said he had acted to counter 'lies and absolute fabrication' in the Portuguese press. The newspaper claimed that the four-yearold's parentage meant her DNA could not be confused with that of two-year-old twins Sean and Amelie. The supposed revelation would prove that bodily fluids found in the family's hire car had come from Madeleine and not from her brother or sister, the tabloid said. Portuguese police are seeking evidence that the girl's body was transported in the Renault Scenic, which was hired 25 days after she disappeared. Such is the power of the press that I believe it is still possible to see the same claim made today on social media. The interesting thing about it is that 24 Horas were adamant that their information was gold standard ... just as Sandra Felgueiras was convinced hers was. Its co- editor, Luis Fontes, insisted he stood by the sperm donor story. He said it was confirmed by the Forensic Science Service in Birmingham, which has carried out analysis on samples taken from the McCanns' apartment and hire car. The FSS denied it had made any comment on the case. There may be those who claim to have immediately suspected the McCanns from the word go ... and that's as may be ... but there is absolutely no doubt that the propaganda campaign orchestrated against them by the Portuguese police is the basis of the sceptic beliefs which sustain and inform the vitriolic twelve year campaign conducted against them.